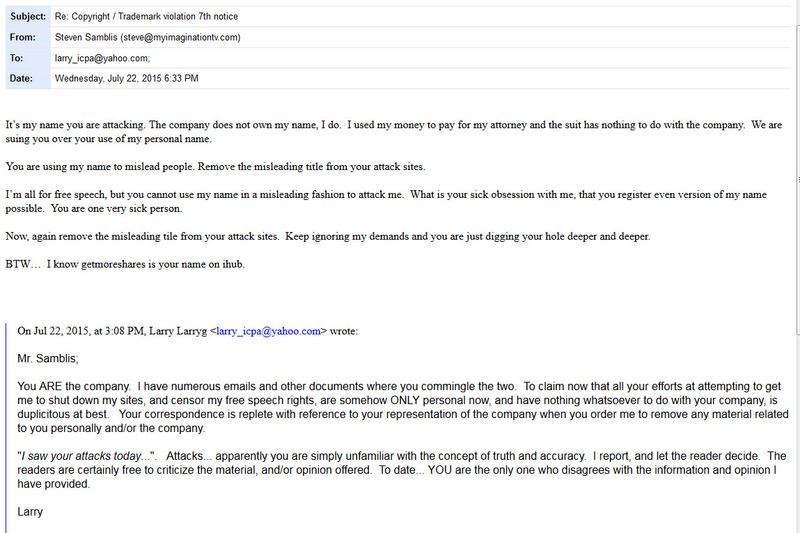 Mr. Samblis says “ I used my money to pay for my attorney, and the suit has nothing to do with the company“. This statement is WAY past ridiculous. Unless Mr. Samblis has a part time job with Walmart, it’s not HIS money – it’s INVESTOR money he is drawing from the company, (supposedly for compensation, for all the good work of getting the company stock PPS to .0001 and no-bid – after multiple reverse splits) ! At some point, say after 10-years of failure after failure, most rational people would come to understand that whatever business plan you have been following – just isn’t working, and it’s time for a change. We feel the most important change that could be made now, is for Mr. Samblis to step down as CEO, and turn the company over to someone who knows what they are doing. It appeared Mr. Collins was on his way to turning around the company, when apparently Mr. Samblis would have none of that. Mr. Collins was promised, in writing (according to a document posted by Mr. Collins a while back) that he was to become CEO within 90 days (details here and here.) 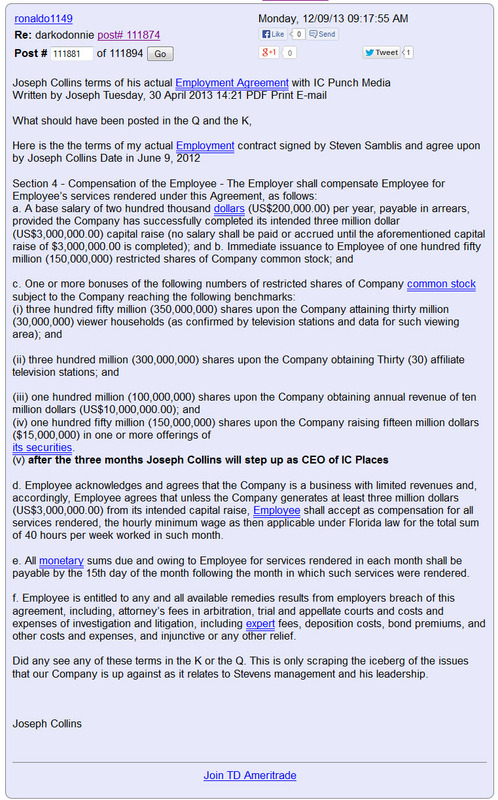 it’s entirely possible that had Mr. Collins been free to run the company as promised, perhaps we would not be looking at what many believe is a worthless company today. It’s decisions like the Collins decision, and the decision to spend investor money chasing Larry (shoot the messenger) that likely has caused this company to be where it’s at today. And does Mr. Samblis learn from his mistakes… apparently not, as he still pursues the messenger to this day, rather then turn around the message. As Larry tried to tell Mr. Samblis many times… its not the messenger he should be going after, he should be focusing on making better business decisions and correcting the message. Even if he stops Larry, there will be many many messengers to follow. 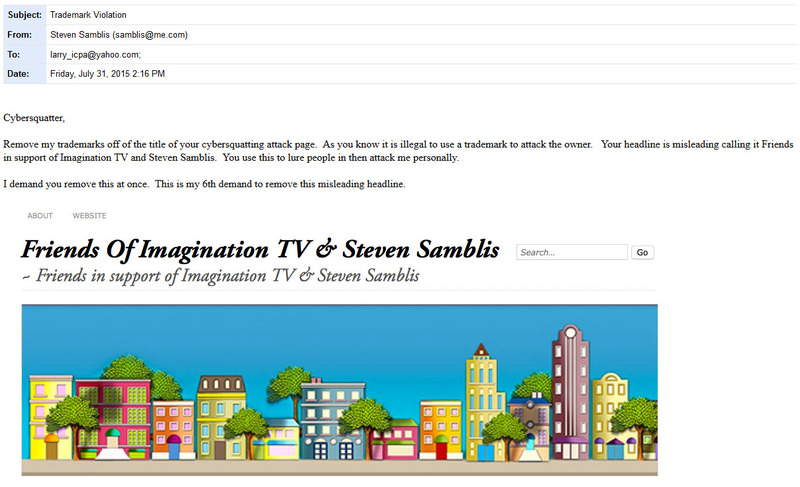 At some point Mr. Samblis will run out of ammo with nothing left to run the company. At that point it’s unlikely Mr. Collins will answer the phone to help. You know what they say about burning your bridges !